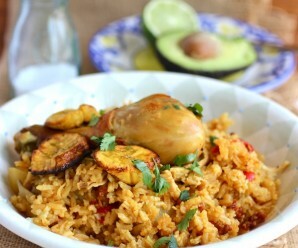 Guest posting today and sharing her delicious recipe is Diana from “A Little bit of Spain in Iowa”. 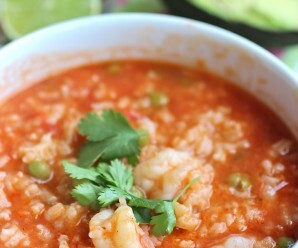 Diana has a beautiful blog filled with wonderful Spanish recipes and gardening tips. First of all, I wanted to thank Erica for asking me to guest post on her blog. I absolutely adore her blog, recipes and love for her country! I have made so many of her recipes and they always please my entire family. 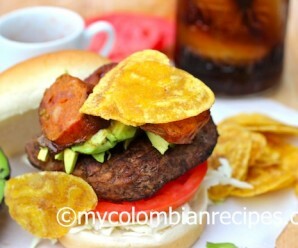 I wanted to share a Spanish recipe unique to my Spanish heritage. This has to be one of my favorite Spanish comfort foods. This is a recipe that I have grown up with and could eat every day if I had to. It’s a super easy recipe and my boys really enjoy it. I do want to apologize in advance for the picture as it was one of my first posts when I started blogging. Chorizo is a dry/cured sausage that is found in every local bar and household in Spain. The taste is amazing. In Spain, they sell different varieties of Chorizo. 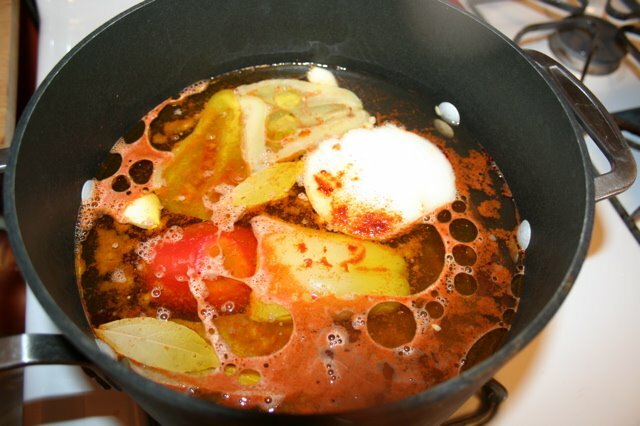 Some that can be cut into thin slices and eaten in sandwiches (bocadillos or montaditos), and other varieties that are meant to be used for cooking in stews. Here in the states, it’s difficult to find a good sandwich Chorizo. One of the only producers is found in California, La Espanola Meats. They are a manufacturer of premium Spanish-style sausages and cured meat products. Locally, Gateway Market sells Palacios Chorizo. Which is a harder Chorizo sausage perfect for stews. Pimenton, is a Spanish Paprika. This paprika gives great taste to foods especially when used in stews! After trying a Spanish Paprika, you’ll never buy the tasteless stuff found in the U.S. This can also be found at our local Gateway Market or online at latienda.com. 1. In a large pot put the lentil beans, chorizo sausage, green pepper, tomato, onion, garlic cloves, and 2 bay leaves. 2. Cover with water 2 inches above the beans, sausage and vegetables. 3. Mix in the Olive Oil and Smoked Paprika. 4. Bring to a boil and simmer for 30 -40 minutes until the lentils are tender. 5. Once the lentils are tender, add the white rice and simmer for an additional 20 minutes until the rice is tender. Super Easy! No dicing of vegetables needed!! Just slice them in half and add them in. My favorite thing about this recipe is that it tastes wonderful the day after! This meal tastes great with a green salad and crusty bread. Enjoy!! Beautiful dish. You can’t go wrong with chorizo. Thanks Diana. Two of my favorite bloggers in one spot. I love lentils and I love chorizo – great combo with rice. I find Chorizo can make some dishes a little too oily. Although that looks amazing, and most definitely delicious. I love anything with chorizo in it. Sounds like a winner of a recipe to me! Thanks for having me Erica! Luigi and Kim – Thank you! Joan and Devina – Besitos!! This looks so flavorful and hearty! What a lovely dish! Both my husband and I love lentils with rice, so I’ll definitely be making your recipe soon! Hope to see ur updates with many more yummy treats.. I love chorizo! Such a yummy dish! 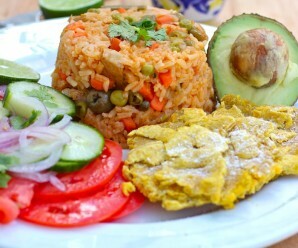 Nice rice dish with sausage…sounds and looks very tasty…yummie! that’s a yummy preparation!! I ‘ve always loved the sausage/lentils combination!! will try this sometime!! I didn’t know we can freeze peppers. Oh my this looks tasty too, a hearty stick to your ribs type of meal that warms you up form the inside. This recipe was what the doctor ordered, feeling the start of a cold coming on. It was very easy and so yummy!!!!!!! Comfort food. I look forward to trying more recipes. 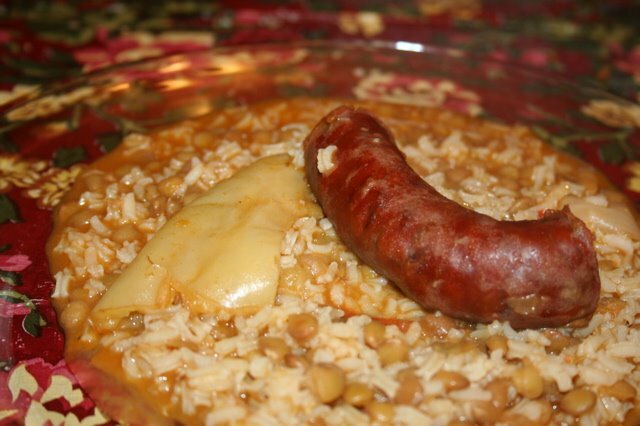 Este plato con arroz, lentejas & chorizo me encanto mucho! !